Rimini. The ENADA Rimini show portrays a good refection of the Italian gaming market. The Rimini show that took place between 14th and 16th March may have had fewer exhibitors than in recent years, but operators remain loyal to the show and especially those who continue to invest and exhibit there. 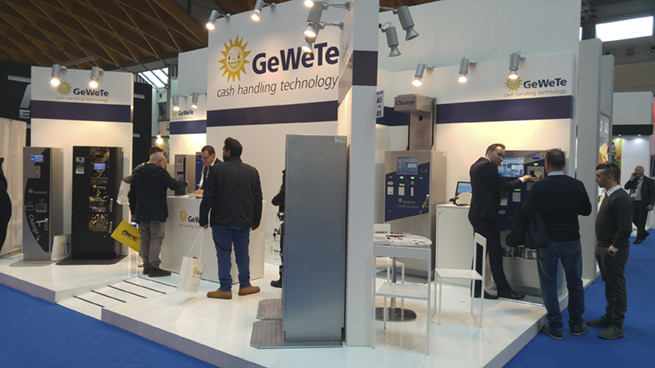 GeWeTe is the only non-Italian redemption and change machine manufacturer that has suc-cessfully established itself in Italy. “Competition is extremely strong in Italy”, explained Aristidis Tsikouras, Managing Director of GeWeTe. “Yet those who believe that price is the driving fac-tor have often learnt to make more critical comparisons and make their calculations and eval-uations based on the long-term and not the short-term. I firmly believe we offer the best value for money in the long run”. Quality, security, flexibility and the fact that GeWeTe machines continue working over time – so optimising machine uptime: all these factors speak for GeWeTe. 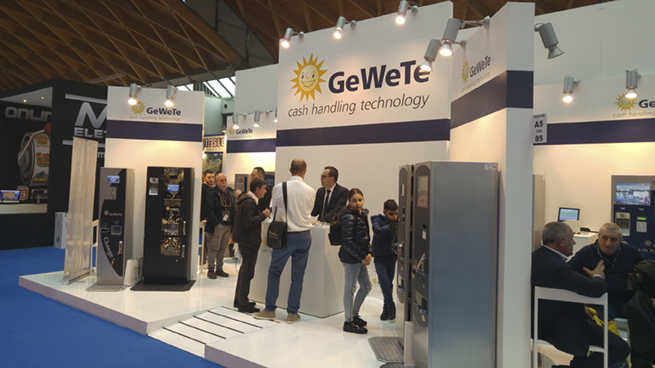 Italian operators further-more appreciate the fact that GeWeTe has a dedicated office in Italy, headed up by Salvatore Caserta. The Cash-Recycler from GeWeTe is the answer for all redemption and change requirements, especially for operators who offer VLT gaming or VLT and AWP gaming together. The Cash-Recycler offers the most complete solution available in such a secure housing, fitted with the most reliable components to enable a host of features, including bulk coin feed, cup dispens-ing, banknote recycling, TITO capabilities. GeWeTe change and redemption machines can be connected with the Italian gaming providers, meaning that integration is simple. “We cover all bases with the Cash-Recycler and have a strong and focused local team to sup-port our customers in Italy. We had many excellent conversations on our stand and were very pleased with the quality of the show. The Italian market is very important to us and we place great emphasis on supporting our customers here – that is something we have proven for several years now”.